Passionate volunteer or ambitious student? Join the Clean Cooking Revolution! We have a lot of projects waiting there just for you! Coordinator based in Stellenbosch: coordinator local projects in Enkanini and Kayamandi. Working with the local network and Clean Cooking Angels. Supporting sales demonstrations, support to customers, local distribution and education. Coordinator based in Houtbay: coordinator local projects in Imizamo Yethu and Hangberg. Building on the local network and Clean Cooking Angels. Supporting sales demonstrations, support to customers, local distribution and education. Coordinator based in Fishhoek/ Noordhoek: coordinator local projects in Masiphumelele. Supporting sales demonstrations, support to customers, local distribution and education. 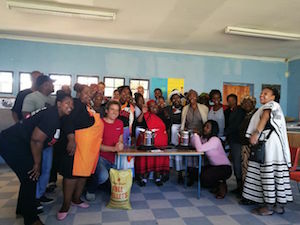 Working with the local network and Clean Cooking Angels. Project manager marketing, based in Cape Town: building the brand, creating awareness, network and brand loyalty. Project manager wineries in Western Cape: building partnerships with wineries in order to reach out to their staff and customers.